Have you lost one or more teeth? If so, we are proud to offer complete dental implant services at Smiles Dental. Dental implants are versatile tooth replacements that can be used to restore your smile whether you have lost only one tooth, a few teeth, or all of your teeth. Our team will make certain that your dental implants look, feel, and act like your natural teeth to restore your oral health, function, and beauty. We invite you to call or visit the Smiles Dental nearest you today for more information! 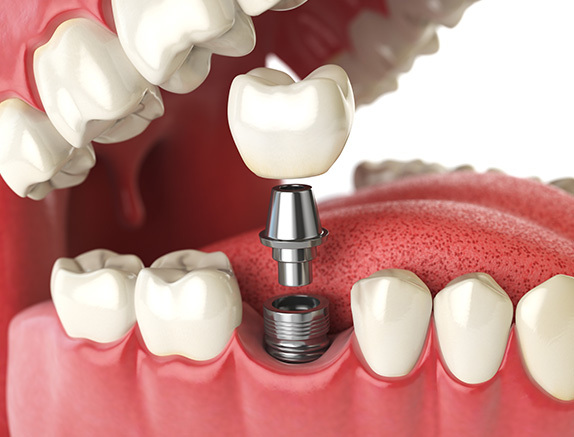 Dental implants are permanent, stable tooth replacements that can be used to replace one or more teeth. The dental implant post, which is a screw made of titanium, is surgically placed into the jawbone at the site of the missing tooth. This replaces the missing tooth’s root and ensures that your dental restoration is stable. A period of healing is required to allow the bone to to bond with the biocompatible post. Following this healing period, one of our skilled dentists will place the dental implant restoration, or replacement tooth, which fits on top of the implant post. Depending on which teeth are missing and your personal dental needs, your implant restoration might be a dental crown, dental bridge, complete denture, or partial denture. Each dental implant restoration is custom made to fit your smile both comfortably and aesthetically. Tooth replacement can restore your smile in more ways than just its physical appearance. When you are missing teeth, your jawbone loses density over time and your remaining teeth can shift into the empty space. Dental implants can help preserve your facial shape and keep your smile looking and feeling its best. They are designed to look, function, and feel just like your natural teeth, and with proper care, it can last a lifetime. For more information about the benefits of implant dentistry, and to schedule your implant consultation, please call or visit us! Save time and download your forms before you get to the office!